I’m always asked by clients “What do you think of such & such for a location for our pictures”. As a wedding photographer it’s natural to be asked this. And honestly, the number one tip I give my clients is that it’s the light that is way more important than the actual location. The light, very simple!! We’re spoiled here in Sligo and the north-west, west, and most of Ireland to be honest, in that we have some of the most amazing landscapes & surrounding areas you can find, anywhere! But if the light isn’t great, it doesn’t matter if the landscape behind the couple is amazing. I learned a long time ago to embrace what we have here in Ireland and incorporate that into my wedding photography. What do we have here more than any other country? Rugged landscape, awesome farm lanes & boreens & even old ancient walls & buildings & ruins. It’s great when a hotel or reception venue has gorgeous grounds. It means all pictures can be done on-site and that naturally gives you the couple, more time with your guests as you’re not spending time driving to & from a location, if it’s not en-route to the venue. But not all venues are the same. And some don’t have many options or any options you might think. But it’s your photographers job to find options! And again, light & vision is where you can still get amazing pictures! I’ve taken pictures surrounded by cars in a hotel car park because of a certain tree being lit beautifully in the evening sun. The couple trusted me & here is the result, and bare in mind, all around us here in this image are cars & people! The scene below is a classic, found nearly everywhere around the west/north-west…a simple country road. This road happened to be on the way to the brides home in the morning, so I seen it then, and knew it would look beautiful in the afternoon when the sun moved position in the sky. The couples preference on location was scuppered a bit because it was a very very windy day, so anything by the coast would be a challenge. Again, they trusted me with choosing this alternative location, and it’s a place the couple knew anyway but never even considered! But what it gave us was a sheltered location with gorgeous light! Ok, so this is a pretty awesome location. It’s in Lough Rynn Castle grounds. But again, light made this image better than normal. Because of the dark clouds that were billowing in the sky, it helped balance out the image. This shot under a white or really bright sunny sky isn’t as good & I normally avoid it then, especially in Lough Rynn where there is much better places to shoot when it’s sunny & bright. Again a beautiful landscape type shot on the west coast of Ireland, near Mulranny with Croagh Patrick in the background. One thing I always let my clients know is that clouds are great, clouds are fab! Like the image above, this is why! If it was super sunny on this day, this would be a tricky shot & very hard to show the mountain range in the background. The kind of photo shoot location I’ve only had once or twice…right in the middle of a busy town/city! It’s not for everybody, but it’s pretty awesome & different, and certainly not what comes to mind when you think of a fabulous location for your wedding photos, but photographing right in the middle of Sligo town was one of the best sessions of the year for me! On the grounds of a hotel, this time Castle Dargan. I’ve been here more times than I can remember, I even got married there myself! But not ever have I taken photos on the golf course, or had any sight of a golf course in the background! There’s so much variety here and it changes throughout the year, and all within 2 minutes of the actual reception where your guests are. Another thing I love, apart from clouds, is wild grass, wild flowers. Castle Dargan used to be even more awesome when they let the grass surrounding the golf course grow wild, but these days it’s always cut for the golfers. The Radisson in Sligo on the other hand has amazing grass & wild flowers during the summer…again you have to time it right & hope it hasn’t been cut! Again a hotel that at first glance doesn’t have the most amazing locations for pictures…but it does! I’ve used it multiple times! I love the feeling of the bride & groom being in the middle of the field here, but brides don’t worry, it was only me knee deep in the flowers, I never ask my couples to get amongst the grass & flowers, I always find a way around it! Also, right behind us is a big ugly concrete shed! Ok, another awesome location! Something Ireland has in abundance, old ruins or ancient abbeys. You could easily spend all day here & find new spots for pictures. But it doesn’t have to be an abbey, old farm ruins come out just as well! Weather in Ireland…one of the most discussed topics amongst Irish people! Sometimes on a country road that’s surrounded by trees, the leaves on the trees can create a canopy that gives some shelter. The image below was taken on a wet day. I rarely ask brides & grooms to go out in the rain, but places like here let you outside without getting wet. Hazelwood is another place I’ve shot at when it’s raining because of the cover from the leaves during the summer. Again light. With the image below, we had actually finished the pictures & were walking back to the pub where the bridal party was. And for about one minute the sun kind of came through the clouds & lit up the trees in the background. A simple country bridge off the main road in Mayo…bridges/roads are always nicer if they have a crest in the middle, I think that comes from my Formula 1 background of photographing cars coming over the crest of a hill! This shot is wild, rugged & beautiful & the type of image I love & thankfully my couples seem to as well! Ok last example, and again, one where the light really makes the image. This was shot right at sunset above Lough Eske in Donegal. An absolutely stunning location and sometimes the location really does matter, but again, this place in the middle of the day with harsh sunshine wouldn’t look as dramatic. So although I do say the location doesn’t matter as much as the light, a nice location is still great to have. It’s just the light will help turn that location into a fabulous one. 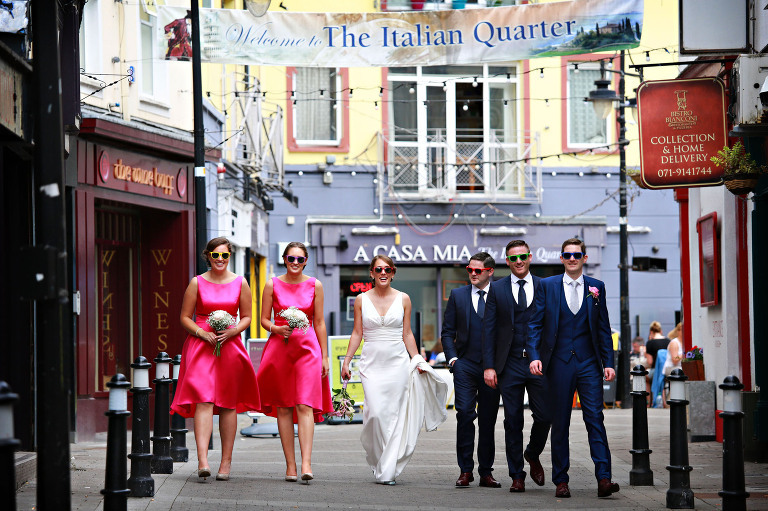 And when I go through that part of the day with couples before their wedding, we usually have a back up plan if at all possible, just in case it’s a bit wet, windy or although rare in Ireland it does happen, too sunny! !